If you want to keep your car looking its best, finding a 3m car film installer is definitely the way to go. This is because many of the things you encounter on an average day of driving can take their toll on your vehicle’s exterior. This can include things like bugs that come into contact with your car as you drive by and small rocks that fly up and cause dings and scratches to form on your vehicle. Over time, your car will lose its attractive sheen, and it will instead take on the characteristics of a dull, lackluster finish. M & M Auto Detailing is located in Connecticut, and we are experienced 3m car film installers. We offer a variety of other detailing services, and we can outfit your vehicle with a barely noticeable protective layer that will keep your car looking just the way you want it to. We pride ourselves with providing our customers with the highest quality in 3m car film installation. By choosing M & M Auto Detailing and our 3m windor film installers, you are going a long way toward protecting your investment. 3M™ Scotchgard Paint Protection Film is the latest technology in paint protection, and it will render your vehicle impervious to those scratches that come from everyday highway driving. In addition, your vehicle will no longer develop those unsightly stains from being left out in the weather. What Does 3M™ Scotchgard Paint Protection Film Do? Sometimes referred to as a ‘clear bra’, paint protection will also guard against the scratches that seemingly come out of nowhere. In fact, 3M™ Scotchgard Paint Protection Film uses technology that allows any scratches that do occur to self heal. It also does not require you to do any maintenance, making it easy for anyone to take care of, and it will stand up to a lot of abuse. It is so tough that it also comes with a warranty. 3M™ Scotchgard Paint Protection Film will give your vehicle the sheen you’ve always wanted, and it will keep your vehicle looking like it just came from the showroom floor. This is good for preserving the resale value of your vehicle, as the protective layer will be applied to areas that are particularly vulnerable to damage. These can include the front bumpers, side mirrors, rocker and rear fender panels, and the hood. 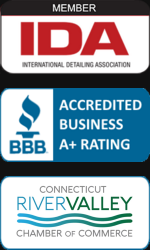 You can visit M & M Auto Detailing online to find out more, you can call us at (860) 430-1889 to schedule work to be done, or you can visit us at our Connecticut location. We will be happy to answer any questions you may have, and we consider it a privilege to serve you.